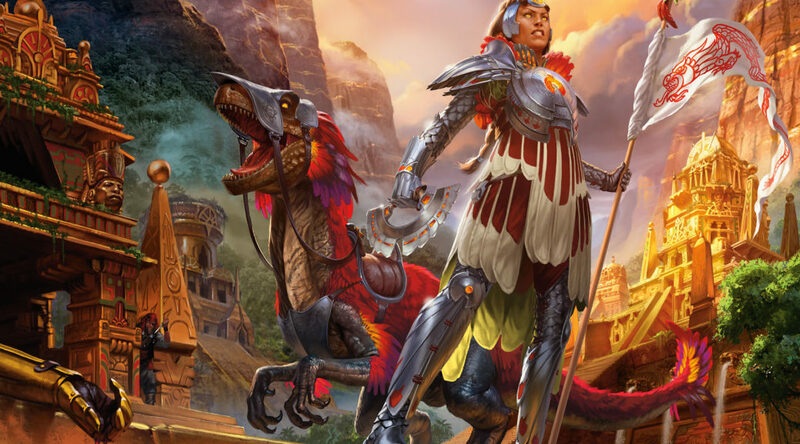 Rivals of Ixalan spoilers are off and running, and they’re fast and furious. With only a week of spoilers, we’ll have the full set by this weekend, if Twitter is to be believed. Each morning’s deluge makes for an exciting, if perhaps slightly rushed, week. In the inverse of clouds and their silver linings, the dark clouds lurking on the periphery of our otherwise lovely summer day of spoilers is that Standard finance is arr eye pee RIP’d. All of these Rivals cards are going to be sweet, and there will be some awesome budget-friendly builds out of your preferred content producer, but ultimately they’ll all be irrelevant because energy is stupid and the most expensive Standard deck is barely more expensive than a playset of fetchlands. Changes in life totals that set function by setting the value to a specific number, rather than a change of a specified degree, are a good bit more powerful in EDH than in normal Magic. Sorin Markov or Magister Sphinx setting a player’s life total to 10 is half a point below the midpoint in Standard. In nearly best case scenarios, setting someone’s life to 10 deals about 10 damage. In EDH, where the starting life total is 40, changing the value to 10 is a reduction of 75%, dealing 30 damage if the player is at the starting life total. Master of Cruelties works the same way, but instead of reducing it to 10, it reduces it to 1. Considerably more savage. He’s been popular since Dragon Maze’s release, and has found life in both 60 card and 99 card decks. EDHREC reports 4,200 decks running him, which is a healthy number. You essentially get to kill one creature each turn during combat if you’re playing fair, and if you’re not, you just make him unblockable and essentially kill someone in one swing. What’s most appealing here isn’t his raw power or how many decks make use of him, but rather the supply. I count six NM copies on TCG right now, all around $15. I wouldn’t expect to see a major surge in price, but this could easily restock around $25 to $30 in the next few months. When the new year starts with world leaders threatening each other with the size of their nuclear button, deathtouch creatures feel appropriate. Archetype of Finality makes sure you’re the only person at the table with deathtouch, perhaps one of the best keywords in EDH, behind hexproof and maybe haste. Giving all of your tokens and various 1/2 value creatures deathtouch is remarkably obnoxious, since it means you can attack fairly safely and also serves as a useful rattlesnake. In a deck like Meren, which is full of small value creatures, it means it’s much harder for your opponents to crash in with their 6/6s and 9/9s. Her play pattern is a bit less thrilling than Master of Cruelties, with only 2,400 EDH decks listed, but that doesn’t mean there isn’t still sufficient demand to push prices up over time. 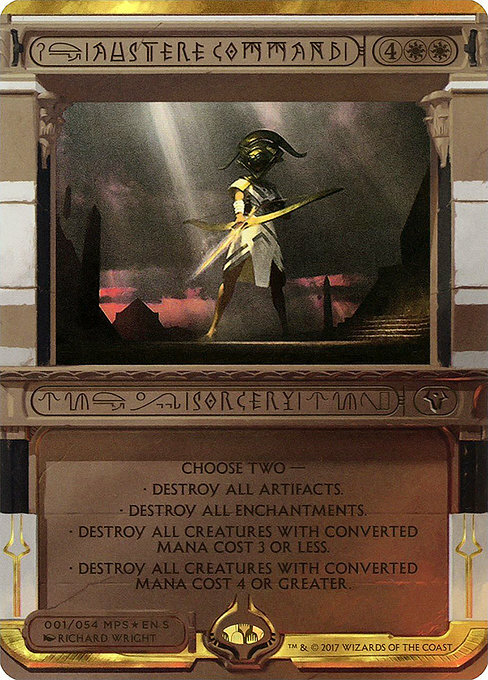 I love that we’re looking at the original Born of the Gods printing here, since those enchantment creature frames look phenomenal in foil. Less than 10 copies remain on TCG right now, which is promising. I don’t expect them to fly off the shelves, but they should all sell this year. What’s especially exciting is how cheap she is right now. With copies at $2, she could feasibly quintuple and people would still be willing to pay the new price tag, since it would barely be $10. While I don’t have any specific Invocation I’m eyeing today, overall they’re a portfolio worth keeping an eye on. There’s no arguing that these were received poorly at launch, as they were the least legible, least cohesive, and least interesting Masterpieces set released. Prices reflected that, and most bottomed out quickly and hard. We’re now pushing a year since Invocations was released, and are likely near the bottom of their absolute floor. With collectibles of this nature, especially ones that start with such an inflated price, it can take awhile for them to settle. Once they do, the slow trickle begins, and two years later you find yourself with copies worth twice what they were in not-distant memory. Given the overall reaction to Invocations, I’d expect Wizards may never revisit the frame. We don’t know whether or not they will with Expeditions and Inventions, but if they do decide to go back to some or all of these, Invocations will be a distant third. They’ll stand in Magic’s history as a divisive and maligned frame, and the least-Magic frame in Magic. There will be demand for that from collectors and purveyors of odd things, which is where the slow trickle will stem. Over the next one to three years, I’d expect prices on many of these to turn northward, perhaps quite considerably. Keep an eye out for any that look underpriced, and where buylist is getting awfully close to retail. Does MTGPrice want an editor? If so, contact me!